Grey Suits with Black Shoes- Matching suits with the ultimate shoes is not always an easy job as it gives away a reflection of your aesthetics when it comes to mix and match. Black shoewear is considered to be easy going as black is neutral and goes well with nearly anything except brown suits. While picking black shoes, you need to be sharp enough as it is essential to look a bit different when making a public appearance. Although black with charcoal grey or any other frequency of grey is considered to be quite typical, however, it is up to you when it comes to styling. You can make something easy going to look OTT and something difficult look like simply casual. Charcoal is a color which is typically owned by every man who loves to slay some formal attires on either daily or weekly basis. 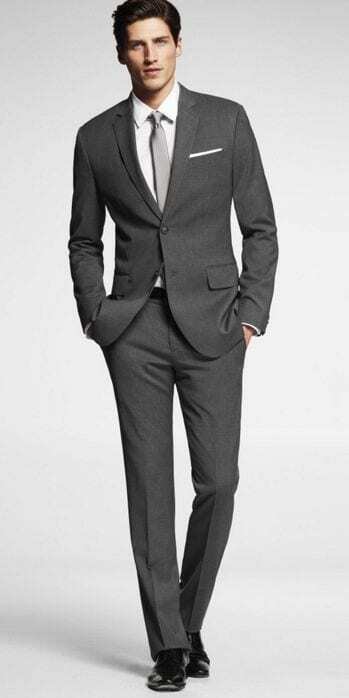 A grey color suit is often considered to be a staple for professional men and is usually worn with the power color i.e. black; most of the times when you aim to flaunt your fashion statement. For a professional demeanor and classic formal look, you go for charcoal and black altogether. However, looking unique is a challenge when picking such mainstream neutral shades. Both of these shades give away a serious and quite respectful vibe. But that definitely not mean that you cannot slay the combo casually, it is all about the way you style yourself i.e. the shoe options available and the inner shirt you are going to add to your suit. Also, you can make a difference with accessories like a brooch or a classy tie. 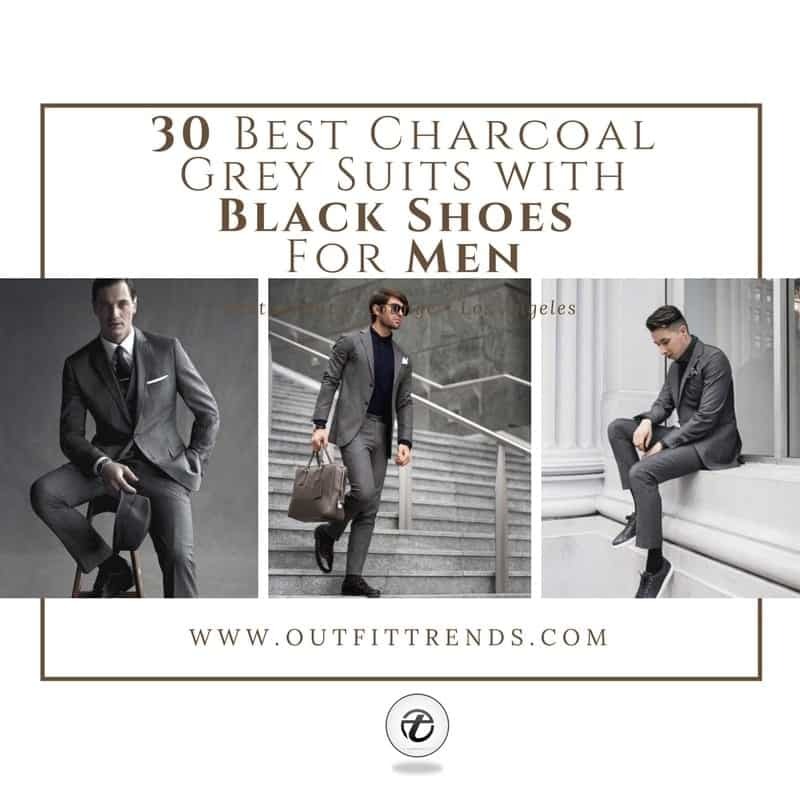 Here I will inculcate 30 best dark grey suits which can be worn with different shoe styles in the shades of black and versatile mix and match options which will enhance your statement. Weddings are all about wearing fancy suits and you can slay some dark slacks with a charcoal blazer and pointed black dress shoes on your wedding day. The look is classic if you are wearing it with a white shirt and luxe ash grey tie. Here are 25 Ideas on How to Wear Double-Breasted Suits for Men. Checks are often essential to add versatility to your look, hence a windowpane check with black dress shoes is a classic option for professional men. Teen guys can simply go for dark grey slacks and slim cut blazer with a white crisp shirt and slim black tie. However, choosing shoes is not as simple with such a simple look. Plain toe oxfords in black will complete this look. A glen check with matching slacks in the charcoal shade can be styled with a white mandarin color shirt and glossy black loafers. Instead of a tie, go for a simple white pocket square. Just like Jamie Dornan, you can rock a dark grey suit with a silvery formal shirt and same color tie at your office. Wear with black oxfords. A charcoal suit with light grey stripes can be worn with pure black perforated oxfords at an office party or a meeting. Do have a look at these 20 Ways to Wear Blue Suits with Brown Shoes Ideas for Men. Wear a dark greyish monochrome suit on a regular day with a polka dot pocket square and silvery grey tie. Black dress shoes will look great with such an attire, however, when wearing informally go for black sneakers and a mandarin collar shirt. Cropped pants are trending and can be rocked with a dark grey blazer and black shiny cap toe derby shoes. Cropped pants also look classy when worn by young men with wingtip derby shoes. A dark grey tux can be paired with plain black Oxfords at Prom. Go for a crisp white shirt and a white or light grey bow tie. All black tassel loafers will look exquisite with a textured charcoal suit on a sunny day with black shades. Here are 30 Amazing Men’s Suits Combinations to Get Sharp Look. A charcoal suit can be worn with a maroon overcoat and maroon striped tie, however, keep your shoes black. Black colored pointed monk-strap shoes can be paired with a windowpane check suit in a dark grey tone. A 3-piece suit in a charcoal shade can be worn with glossy black loafers on a formal party or dinner. Black matte shoes can be worn with a printed charcoal grey suit and turtleneck sweater during winters. The attire is both stylish and semi-formal as well. A greyish monochromatic suit in bird-eye print can be worn with black glamorous loafers at a business party or award ceremony. Check out these 30 Ideas How To Wear Loafers Shoes. Socks in bright neutral colors like rust or maroon can be worn with black shoes and dark grey suits on weddings or engagement ceremonies. Groomsmen can slay on the wedding day in charcoal grey suits and black shiny dress shoes. However, they should keep the ties and pocket squares in a bright shade to further enhance the look. Wear black ankle boots with a check print charcoal blazer and matching slacks over a turtle-neck black knitted sweater. A double-breasted charcoal suit can be worn over a black crisp shirt and matching dark loafers. Pair a classic charcoal woolen blazer with low-top black converse and straight khakis for a semi-formal look. Here are 12 Pro Tips for Men on How to Wear Black Shoes With Khaki Pants. Gingham print blazer can be rocked with black slacks and mattified Chelsea boots. A slim fit charcoal blazer and cropped matching pants can be worn with black perforated loafers. ↓7- How to Wear Charcoal Suit with Sneakers? Black low-top sneakers can be paired with a dark grey suit and avoid any ties. For a business tour, go for a navy collar shirt with a charcoal blazer and black bit loafers. Charcoal blazer over a black tee can be worn with dark wash denim pants and black sneakers on a casual workday. Here are 18 Latest Men Casual Outfits with Blazers. Wear a gingham grey suit with black tie and pocket square as well as black brogues on an office day. Boho look can be achieved by adding a classic black hat to your striped suit and black pointed shoes. Charcoal blazer over a check print shirt and light grey slacks look killer with tassel loafers. A slim fit glen check can be rocked with black shirt and loafers. How can I get the whole attire. Charcoal blazer over a check print shirt and light grey slacks look killer with tassel loafers. Its an advert number two.